The art of brewing beer has had a solid foothold in the city since the 14th century. 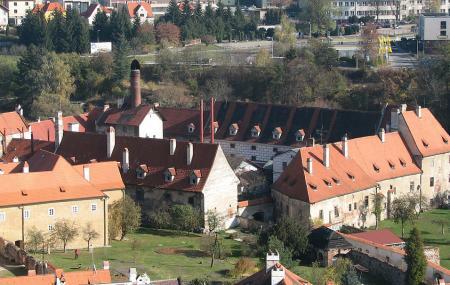 On the 17th century the Eggenbergs acquired the real estate around the city and that included this brewery. A technique was refined by which a special blend of water was used. in other words throughout the history of this Brewery the methods and Technologies used have been constantly updated. Today you'll find here a brewery, a pub with seating for 70, and a stylish restaurant with seating for 200. For those of you who want a special insight into the craft of Brewing, the place offers tours which end in a testing session. There is no need usually to make a reservation. The building itself is sheer historical charm. Tours of the brewery may be cancelled for renovation. Contact the brewery for details before the day of your visit. Tours start 11am daily. Between May and September and extra tour is held at 2pm. The opening hours giving here are approximations. Please contact the attraction before your visit. How popular is Eggenberg Pivovar? People normally club together Town Hall and Graphite Mine while planning their visit to Eggenberg Pivovar. Very cool brewery (since 1560) atmosphere, though no sings if actual machinery, either used or for display. Food was good and the beer very tasty (you can get unfiltered one) and the waitress was kind. The photo is taken at 21:30, right after the kitchen was already closed. As I mentioned in the rafting tour post, this is one of the class spots to stop for a bite and a drink along the way down the Vltava. Set in a beautiful, historic building, you'll eat family style with other guests - probably rafting groups if you're here in the summer. Stop in, have a drink and meet a friend! Extremely slow service, mediocre food, I was very disappointed. Eggenberg beer! Do I have to say more? Awesome!